Creditors of the City of Stockton, California probably wish that Judge Christopher Klein's ruling that the city can proceed into bankruptcy over their objections was an April Fools joke, but it just isn't so. Monday, April 1, Judge Klein accepted the bankruptcy application of Stockton after creditors walked away from negotiations. 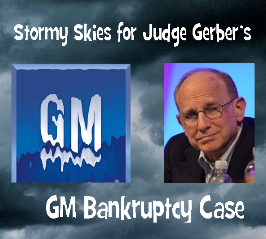 It is good to see a bankruptcy judge who won't let creditors walk all over him, unlike Judge Robert Gerber who let creditors in the General Motors bankruptcy case make a fool of him by hiding a $367 million payment to GM Canada. Because of this, Gerber is having to revisit this case and the entire GM bankruptcy could come unraveled. I met Judge Klein at the National Council of Bankruptcy Judges conference in San Diego last October. We had a long discussion about bankruptcy courts and processes. He is a very good teacher and impressed me as a solid jurist who runs a very efficient court and rules on the law. This is a strong contrast with what we have seen from the Southern District of New York judges who seem to be more like social workers than judges. Judge Klein's ruling was a shock to the creditors who seem to be used to getting their way in bankruptcy courts. The LA Times reported that this case will be monitored closely as it may set a new precedent for the handling of city bankruptcies. Stockton is the largest city to date to file for bankruptcy reorganization. Reason.com posted an interesting story about municipal bankruptcy and the impact it could have on the rest of us. They also had some insight on how bankruptcy courts should work. Bankruptcy in America is a strange bird. It permits debtors to be relieved of their financial obligations by paying less, often far less, than they owe. It compels creditors to accept less, often far less, than they are due. It is generally an orderly and mechanical process presided over by a neutral judge without a jury. Its goal is to get the creditors something, leave the debtors with something, and let all parties go home in peace and resume their livelihoods. But it rarely happens to the government. That's because the government, which has no competition, creates no wealth, doesn't produce anything of value and needn't attract clients, has a monopoly on the use of force with which it can extract what it needs to pay for its mistakes in the form of higher taxes. These extractions, of course, are not voluntary transactions as when you buy gas for your car or food for your table. They are mafia-style transactions: Pay us more, or else. The "mafia-style" transactions is an interesting comparison. Especially if you look at the LyondellBasell and Chicago Tribune cases where frivolous lawsuits are being filed against mere shareholders, extorting settlements from innocent stock holders whose only offense was the mere purchase of stock in their 401K. It will be interesting and revealing to watch Judge Klein's rulings in the Stockton case. Hopefully Judge Gerber will take some lessons from this jurist. We are STILL waiting for him to do his job and make some rulings. The GM case still hangs in the balance and LyondellBasell shareholders are still paying lawyers because Gerber won't make a decision. Isn't that what judges are supposed to do?